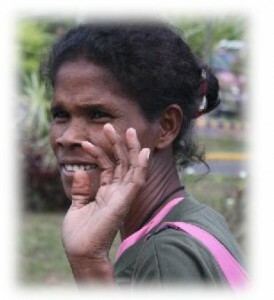 The Ati, a Negrito ethnic group, are mostly found in Western and Central Visayas. Large concentrations are found in Aklan, Capiz, Antique, and Iloilo on Panay Island, and the biggest group is in Iloilo. There are also Ati populations on the islands of Guimaras and Negros (comprising Negros Occidental and Negros Oriental). Few Atis still speak their traditional language, as it has been replaced by Kinary-a, which is spoken in Antique and some parts of Iloilo. Atis cultivate a variety of crops for their livelihood. Tobacco is bartered for the products of their Visayan neighbors. During September and October, they work at the sugar plantations of Christian landowners. Other means of subsistence are hunting, fishing, handicrafts, and bow-and-arrow making; working as household help and midwives; and practicing herbal medicine as herbolarios.